Me: Wow! That was great! Friend: Wasn't it? Totally great. Me: Yeah. [Pauses.] So great. It was difficult to sum up just what exactly I liked about The Eyre Affair. The heroine, literary detective Thursday Next, lived in an alternate world where the written word, from classic works of fiction to pulp romance novels, was an international obsession. The Eyre Affair was funny and irreverent. It mixed genres to create this wonderful literary chimera and was bursting with novel ideas. I loved it. 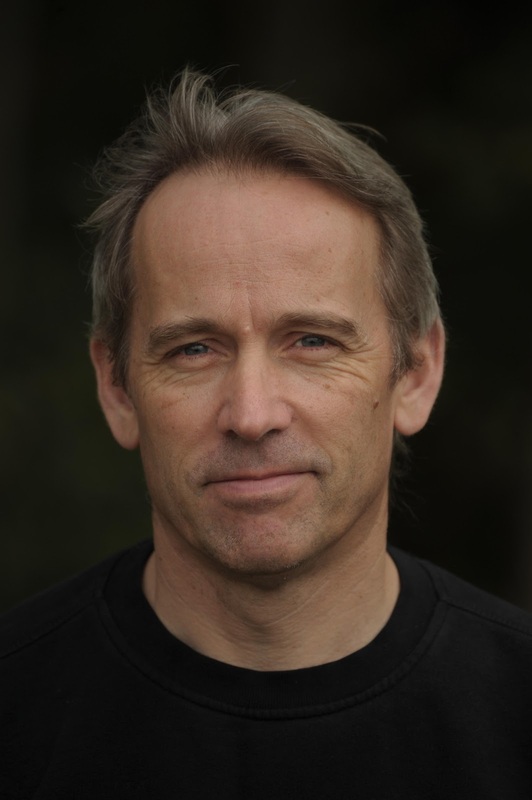 Now, eleven years and six Thursday Next books later, Jasper Fforde has written the seventh in the series with The Woman Who Died A Lot. Much has happened to Thursday since we first met her in The Eyre Affair and she has the scars, enemies, husband, and two teenage children to prove it. The novel won't be out till October 2 in the United States so you won't find any spoilers here, but you will get an awesome peek at the brain behind some of my favorite books in my interview with Fforde. MS: Reading a Thursday Next novel is like walking a tight rope... in the dark... while people constantly jump out of nowhere to make witty comments or yell "Boo!" The books are thrilling and highly entertaining reads that require you stay on the lookout for clues and red herrings at all times. What has the writing process been like for the seven books so full of twists and turns? JF: Difficult to say, really - I write the way I write because I enjoy it and it amuses me. The books kind of grow in a fungal sort of way - I started with a few ideas that I wanted to try and squeeze in, then simply played with them until they slotted together, using the slightly off-kilter Nextian universe as an adaptable glue or framework to bond together the events so they could somehow make sense. A lot of my writing involves narrative gymnastics - attempting to link disparate ideas into a coherent whole without leaving any gaping holes - it's more like roadworks, to be honest. MS: London (just an hour and a half east of Thursday's home town of Swindon) is currently hosting the 2012 Olympic games. What type of sports competitions would be part of the Olympics in Thursday Next's universe? JF: Well croquet, obviously, and unicycling is pretty big - hockey, sprint and endurance. I expect aerobatics might come into it, and queueing, naturally. Queueing should be an Olympic event - it's one of Britain's biggest participation sports, after all. MS: Growing up Welsh-American in the States, I've always been keenly aware of any rare mention of the country. Lately, it seems like Wales and the language have become a big part of science fiction and fantasy from Torchwood to Thursday's Socialist Republic of Wales. What do you think makes the little country such a good fit for speculative fiction? JF: I'm not convinced Wales has yet achieved it's full potential as a locale for fantasy adventures - but that is its charm. The Welsh are at ease with themselves and their heritage, and that to constantly blast it out into the world would seem brash and arrogant - and the Welsh aren't like that. Just leave us to our valleys, our rugby and our singing, and the rest of the world can do what they want. MS: Thursday Next, her daughter Tuesday, Shades of Grey's Jane, and The Nursery Crimes' Mary are all very strong female characters. Was creating bold and competent heroines something you consciously worked toward or did it just come about naturally? JF: It came about naturally - I think women are immeasurably more complex than men and more fun to write, and having strong female roles kind of worked with the stories I wanted to tell. 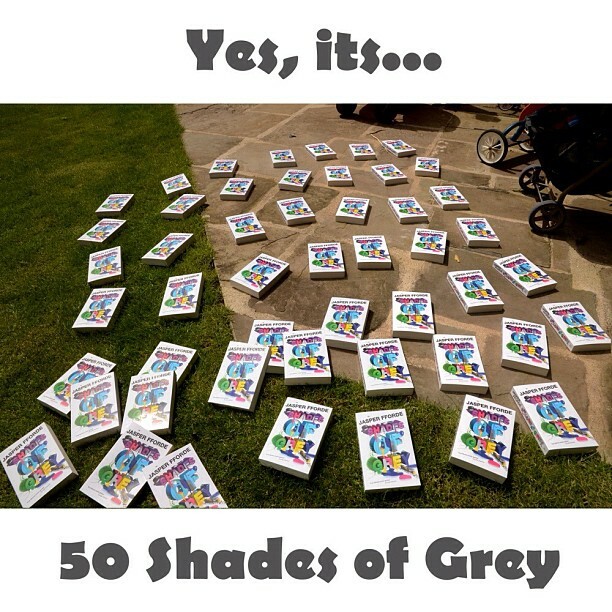 Fifty copies of Fforde's dystopia, Shades of Grey. MS: Speaking of Shades of Grey, a friend of mine works in an upscale housewares store and someone keeps stealing the spoons from the displays. I can't help but wonder if some enterprising individual is preparing for the Shades of Grey dystopia where no one is allowed to make that particular type of utensil anymore. So, I gotta ask, what happened in Eddie's world to precipitate that rule? JF: I think it's explained in the book - that it was a mistake in the 'Word of Munsell', the book that governs all their lives. The person who wrote it simply omitted spoons from the list of cutlery you could make, and that was it - a warning against the literal interpretation of a guiding text, and the complexities that can arise from adhering too rigidly to the rules. MS: Shades of Grey is a science fiction novel set in a dystopic far future and the Thursday Next books are a wonderfully chaotic blend of urban fantasy, English literature, time travel, and classic mysteries. What sub-genre would you like to explore next? 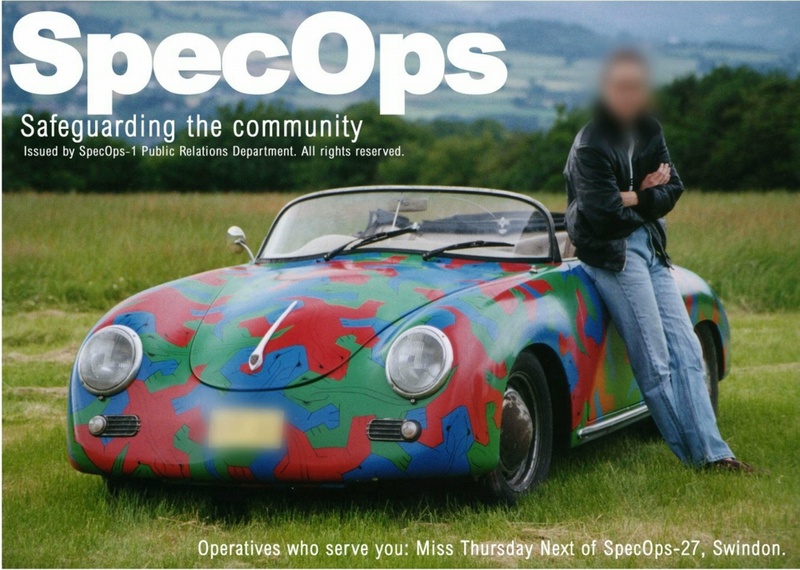 JF: Who knows? I write very much 'on the hoof' so have little idea how a book will turn out once I've started. Some subjects lend themselves well to a particular genre, such as the Nursery Crime books, but I'd like to work more with character, just in unusual situations - cowboy accountants, for instance, or plumbers working on space stations - mixing the ordinary with the unusual. MS: In a guest post for John Scalzi's Whatever blog, you wrote that you have twelve or so writing rules including choosing the less traveled path and never using the word majestic. What are some of your other ones? JF: They are never the same twelve. Another rule might be: 'The Never ending pursuit of a lame joke' which involves finagling in a daft joke, no matter what the narrative cost. I invented a character name Felix7 once, who is a different person with the same face. Thursday kills the first Felix only to encounter him again - so she says: 'Haven't I seen your face somewhere before?" That was the gag, and Felix7 existed only to make it work. But on the journey we had a lot of fun with the character, added drama, and even made a comment upon Felix7's master, Acheron Hades. The gag was there, sure, but making the gag work revealed something new and exciting and different. Can't wait till October 2? Head on over to a UK bookseller for copies of The Woman Who Died A Lot and The Last Dragonslayer already released in Britain. (Note: Amazon UK won't let you download Kindle editions if you live in the States. Believe me, I tried.) New to the works of Jasper Fforde? Get started with Shades of Grey, The Eyre Affair, and The Big Over Easy. Still not enough Jasper for you? You can always find more, including bonus content for his novel on his site, JasperFforde.com. Playstation codes are available here for free. These psn codes are used on various playstation platform to make the world of gaming over playstation more interesting and exciting. It has free access to live playstation online. It is the real world of gaming. Visit to know in detail about various offers from playstation and also know in detail about online playstation and free gaming. psn generator Gaming is very important in everybodys life. And games over playstation are loved the most. So we bring you the best website for gaming over Playstation with free codes availability, Visit to get codes from playstation for free and get access to live gaming over Playstation.